Define white and black lists – set the list of assigned users to represent either a “White List” or a “Black List” for the user being configured. 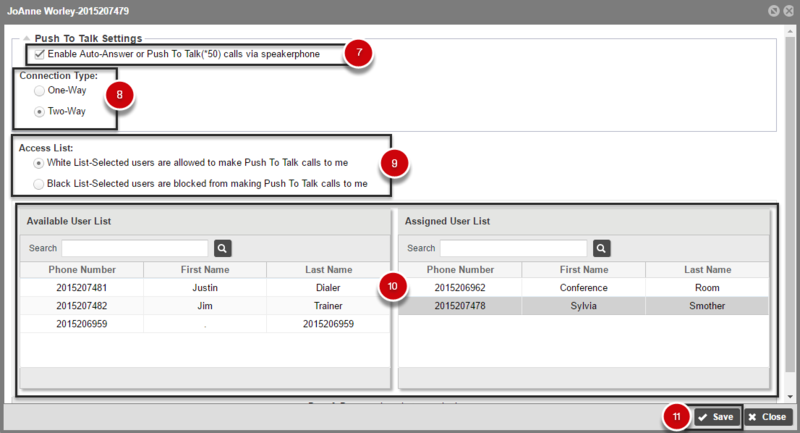 The white list represents approved Push to Talk callers for each user. The black list represents the Push to Talk callers not allowed to interact with the user. For example, you can create a white list for Jim, in the warehouse, for all customer services reps to allow them to push to talk to Joe regarding inventory, delivery schedules, etc. and create a black list for Jim of all the sales reps so they do not constantly check on order status’ and special requests that can interrupt Jim during his busy day. Define One-Way or Two-Way settings for Users – one-way only allows the configured user to place Push to Talk calls to other users. Two-way enables communication between the users in both directions. How do I set up Push to Talk for a User? A. How do I set up Push to Talk for a User? Click the User Features tab. Select the User you would like to configure and click Edit. White List-Selected users are allowed to make Push To Talk calls to me. 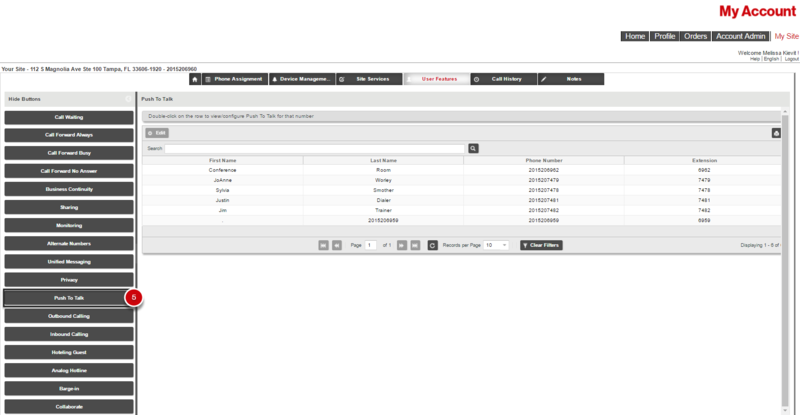 Select users from the Available User List and drag to the Assigned User List.